There are over 1000 islands in the Maldives and 200 that have resorts.Male is the main island and has the airport but people do not holiday there.With bright white sands, warm turquoise clear waters, ample diving and snorkelling opportunities, luxurious spas, delicious food, what’s not to love about the picture-perfect Maldives. No two islands are quite the same. The northern atolls have more snorkelling options while the southern atolls are better for diving. The Maldives can be expensive as everything has to be shipped or flown to the islands. Your international flight arrives in Male and you are transferred to your Island by Sea Plane, Speed Boat or Ferry. 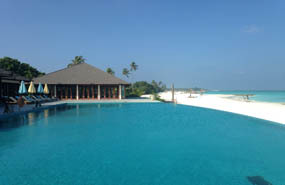 A beautiful luxurious hideaway, intimate and magical setting with 57 Water Villas, 9 Beach Villas, 11 Family Beach Villas, 8 Double Story Beach Villas or the lavish Presidential Beach Villa – Water Villas are the standard room category here, which is unheard of in the Maldives because the Water Villa supplements can be quite high. 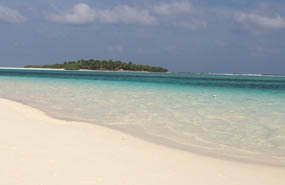 The Island is in the North Ari atoll and shaped like a curved Dhoni; (Maldivian boat) where water and sand lie in contrast to the green foliage. I indulged in the fine food and at Jahaz where you have breakfast and evening buffet, Jing a speciality overwater restaurant where they serve fantastic lobster and Meeru a traditional Maldivian beach grill with a selection of fresh seafood restaurants plus Jahaz, Jing Bar & Wine Cellars for that sunset cocktail or 3 or late evening drinks. The All Inclusive package here, include a choice of over 150 wines, premium brands and fine dining. 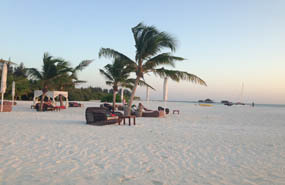 The island is surrounded by soft white sandy beaches with oversize bean bags dotted around where we would spend each evening sipping cocktails watching the sunset. The snorkeling at Halaveli is fairly low key but there is access to excellent diving and snorkeling nearby – including four protected marine areas. There’s also the relaxing and rejuvenating overwater U Spa by Constance, with Valmont treatments and Brice Nisham podiatry. This resort has one of the Maldives’ largest infinity pools, and an award-winning Devarana Spa with elevated treatment rooms among the coconut trees. 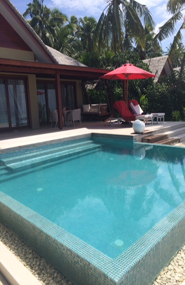 I stayed in a Beach Villa with private pool. It was very spacious with a lovely bathroom half under cover including an outdoor shower – Also and indoor shower if you prefer !! With a unique combination of beach and lagoon access, all Water Villas are furnished with subtle Thai touches and modern amenities. There are 3 Restaurants, The Market which is buffet, Sea Grill serving seafood and steaks overlooking the sea and Benjarong a Thai themed restaurant. Dusit Thani had one of the best House Reef’s I have ever experienced – You can snorkel directly off the beach and you have every chance of spotting the Turtles, we swam with one on more than 2 occasions. The underwater life is quite something here, completely untouched and a pristine undamaged reef. I would highly recommend this Island to keen snorkelers and divers. I (Maggie) was invited on an Azure Ambassadors trip staying in Four Seasons Kuda Huraa, Four Seasons Explorer a 39 metre three deck catamaran and ending in Four Seasons Landaa Giraavaru. 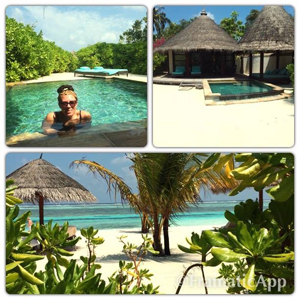 Vicki also stayed at both Four Seasons Islands on her own holiday. 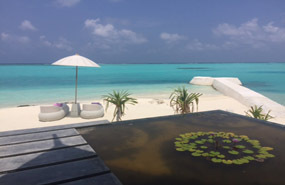 I just had the most amazing time, I was as busy as I wanted to be but as the Maldives are so beautiful I did find that I wanted to sit and relax and take in the amazing views. The sand is so beautiful and the sea so clear it is hard to drag yourself away. 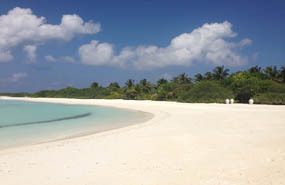 Kuda Huraa is a private coral island with verdant gardens and exceptional surf. A very warm welcome on arrival in our speed boat which had transferred us from Male. There is a mixture of Bungalows and Villas , 96 in all but you don’t feel that you are crowded by accommodation as there is a lot of garden and greenery. 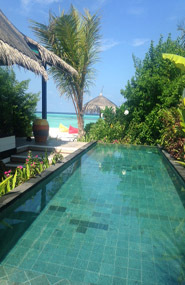 I stayed in a Beach Bungalow which was stunning, I had my own plunge pool and a private garden surround which then took me out onto the beach. 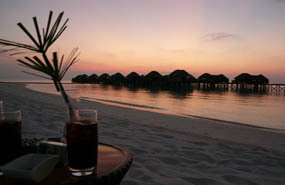 There are Water Villas also which are very popular, personally I preferred the Beach Villas they felt more private. Food and service were as you would expect from a Four Seasons property, very delicious and a great selection of fresh seafood. What did surprise me was the amount of things to do on this island. I did Yoga at sunrise , I had not done Yoga before but it was so relaxed and the Yogi was superb so it was not a problem and a great way to start your day. I had a go at Windsurfing, something else I had not done before. Such great fun, I just about managed a wobbly stand for a short time before finding myself back in the water. They actually offer a Seaplane surfing safari too which sounds just amazing. Other activities were Kayaking, which I tried, Catamaran sailing, didn’t have time to try and the obvious one snorkeling which I did at every opportunity. There is an interactive and educational Marine Discovery Centre with a turtle rearing program. This was really interesting and the tiny turtles were really cute. Very informative and Four Seasons are proactive regarding the local environment. The Spa is on a tiny island which you go across to by boat for a wide range of treatments, which I did try. I don’t dive but if you do it was readily available. The staff were very warm and friendly and were keen to make sure you enjoyed your time whilst with them. With 44 acers and 103 villas this islands with gentle beauty and cultural traditions of the Baa Atoll UNESCO Biosphere at Four Seasons Resort Landaa Giraaavaru – an unspoiled wilderness in the midst of the Maldives richest waters. Snorkel with the world’s largest population of manta rays at the nearby Hanafaru Bay, alongside the team working tirelessly to protect them. 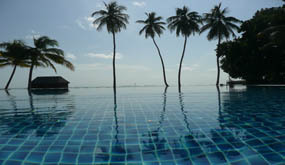 Let the Landaa Spa angels introduce you to the life-changing ‘science’ of Ayurveda. 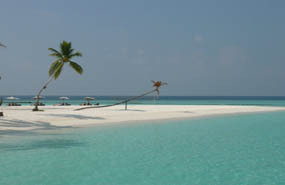 Maldives to the max with kite-surfing, sandbank BBQs, Anti-Gravity Yoga, Sea Turtle Rehabilitation and more. 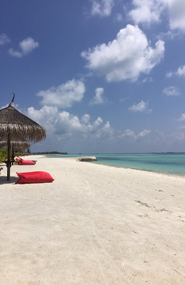 Accommodation here at Landaa is luxury throughout with every single Beach Bungalow and Beach Villa having its own private pool – Those belonging to the Beach Villas are some of the largest private pools in the Maldives. 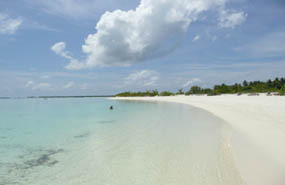 Each one has direct access to the stunning beach no matter what side of the island you are located. All in all, whichever property you chose, you will receive beautiful accommodation and the fantastic service you would expect of a Four Seasons Hotel. 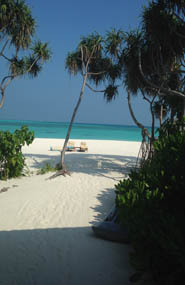 Kanifushi offers 132 detached villas and suites separated by a few meters of tropical vegetation for guest privacy. All villas have direct access to the pristine white beach and the beautiful turquoise lagoon beyond, whilst being surrounded by some of the tallest coconut trees in the region and lush tropical vegetation. We stayed in a large Junior Suite with outdoor bathroom and rain shower. The mini bar ,which is included in your All Inclusive package is amazing with a bottle of Red and White wine daily , a bottle of sparkly on arrival and 2 bottles of your choice of premium spirits plus the normal soft drinks and beers . The Island is 2 km by 90ft long spit so one side of the island is a sand road, then the Villas, beautiful white sand and then water. At one end of the island is the main restaurant, large pool area and bar. The food was delicious with many different stations cooking fresh food plus a BBQ, pizza oven and Indian tandoori oven. All the salad and starters, cheese, desserts are kept in an air conditioned room so it stays so fresh. At other end of the island has a Vegetarian Indian influenced Restaurant and small al la carter Restaurant where you can have a romantic meal on the beach. There is an adult only pool and bar that serve lunch. This end of the island you have the pool villas. The Villas have a lot of room to sit outside on the beach and a drinks cart would pass hourly if we could not be bother to walk 20 feet to the room. The sea was another 20 feet away so not a long way for a cool dip. In the main bar at night they had either live music, a DJ or a film . We flew with Oman Airways and it was OK with lots of room as flight not full. It was good to have the stopover in Muscat to stretch our legs. When we landed our hotel collected us and took us to a private lounge to wait for the sea plane. The sea plane took about 40 minutes and we arrived late afternoon to a lovely beach villa (148) on the west side. On arrival we walked along the jetty with the clear water and fish swimming either side of us we felt we were in paradise. The island and water was the most beautiful we have ever seen. The water villas are east so sunrise and near the reef edge .Our Beach villa had an open air bathroom with a big shower and a big bath. Plus a patio area and 2 sun beds on the beach. You could see the sea when lying in bed. We had complimentary sparkly wine and free WiFi. The food was fabulous and although we do not like buffets this was excellent with “cook to order” stations. The quality of the meat, fish and seafood was outstanding. There were Italian and Indian restaurants which both were very good but were not included in the half board. The staff where extremely friendly and attentive .The bar had the most unique cocktails including one called Hickory Daiquiri Cox which was served out of a smoke filled decanter. The entertainment was excellent with a live band each night. The beach and water were out of this world, the best I have ever seen. The beach area was very large for an island in the Maldives. Around the pool area were massive day beds and lots of “freebies” including fruit, smoothies and ice creams. The island was 1000 metres by 200 metres so did not take too long to walk around and on the east side there were two very friendly trigger fish which loved to be fed. There was another bar and day bed area with a marvellous hammock in the water at the north of the island .Each evening they had a cocktail hour with free canapés to watch the sunset. Not only did you have this beautiful island but also another small island a short speed boat ride away. This had sun beds and a restaurant and bar hidden in the trees. It was a tropical paradise hideaway. We went on the sunset cruise and saw over 40 dolphins which was amazing. We would highly recommend this hotel. You land at Male and are transferred to the Island by boat. This is one of the largest islands within the Maldives. We stayed in a Water Villa that was only 50 yard from beach (Room 302) and bar. You can access the sea from steps from your veranda. I loved watching lots of fish including rays from our room. This side of the island has very calm, clear sea .The main restaurant ,bars , reception, dive centre , games room with a snooker table and Gym were on the other side of the island which was only a 5 minute walk .There are three restaurants and 9 bars around island . It had a beautiful spa set out in the sea .There is a small golf course for the guests who want to practice while they are away. They have afternoon tea and cakes in case you get peckish. The evening entertainment was varied between a live band, crab racing, a film, pitch and putt into the pool and dancing to a DJ in the sand. The island is about a mile to walk around. The hotel often offers you a 3 day mini cruise on a small boat around various islands on an All Inclusive basis. Many guests told us it was fabulous. This is unusual Maldives Island as there are two – Play and Chill, Niyama Private Islands Maldives offers up the luxury of choice. At Chill: Revel in a peaceful moment within the cocoon of Drift Spa. Explore culinary heaven offshore. Soothe your soul to the slow rhythms in over water studios. Nest is an Asian avant-garde cuisine in a surreal tree top setting. Teppanyaki, Thai, Chinese and Indonesian. This was our favourite – Dining high up in the trees was quite an experience and the food was amazing. Subsix Underwater playgrounds for Champagne breakfasts, subaquatic lunches, weekly glow parties, wine tastings and destination dining. Tribal is an African, Central and South American cuisines amidst blazing fires. Plus a Deli and 2 other bars. There are 10 different room types with each villa having a secluded deck that offers pure privacy to luxuriate in al fresco rain showers, moonlit dips, or an intimate afternoon basking in the sun. But staying indoors can be equally as indulgent. Each room is outfitted with a king bed, Deli-In with full-size refrigerator overflowing with gourmet treats, in-room entertainment system with LED TV, Bose surround sound and a range of international movies, as well as Thakuru (butler) service – for the ultimate luxury. 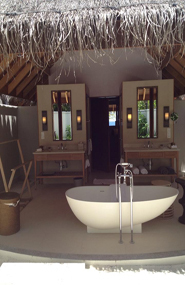 Niyama has the most stunning rooms in terms of comfort, luxury and décor – Every room is equipped with its own ipad, where you can make restaurant reservations or keep up to date on your social media! 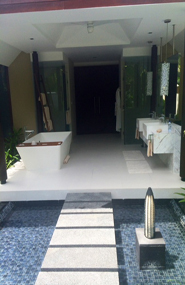 I think the bathrooms at Niyama are probably the best I have experienced in the Maldives, fabulous outdoor shower, as well as the standard inside shower and a lovely oblong freestanding bath. 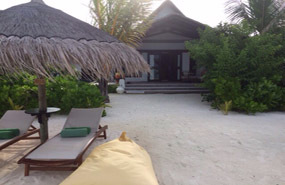 Our Beach Suite was located on Play Island which felt like our own private secluded island! 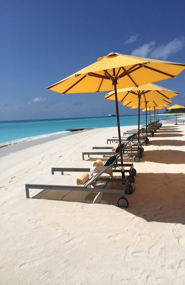 Hours would pass before anyone walked along the beach section in front of our private pool. If you want full on relaxation and the feel of a Robinson Crusoe Island, then a Beach suite at Niyama is the perfect location. It takes 45 minutes by luxury speedboat from Malé International Airport. 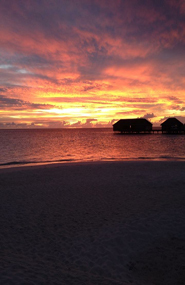 Ozen is on the North-South Island of Maadhoo with guest villas facing due east and west offer stunning Sunrises and even more amazing Sunset views. They call the Villas Earth, which are on the Beach and Wind, which are on the water. 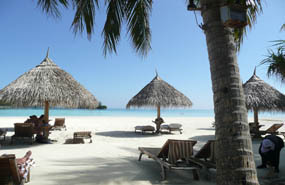 Their leading rooms are the same price for beach or water villa which is an unbelievable offer. They both are sunrise facing.The large pristine lagoon, with exotic marine life all around offers the discerning traveller a true Maldives island experience! It features 41 Beach-front villas, idyllically positioned on a soft, pristine sandy beach. Additionally, 49 over-water villas, built on creatively designed stilts, offers a romantic and mesmeric experience, truly unmatched. The All Inclusive package is unbelievable. You do not want for anything with premium drinks, wines and champagnes. Twice daily your mini is stocked with beers, wine, sparkly, chocolates, crisp and two full bottles of your choice of spirits .Plus you had a choice of either 3 spa treatments or 3 dives free if you stay for 12 nights. 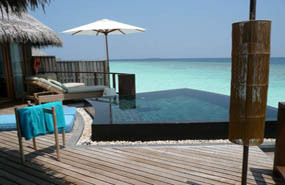 Our beach pool villa (number 404) was beautiful with 30 ft pool and only 20ft from the sea edge. The room was large with everything you could wish for . Outside on the beach were sunbeds and Lazy Boy cushions to sit and relax on .I love the huge bathroom with outside shower. All have Butler service. There 4 restaurants including M6.6 which is underwater. You ate a 7 course menu of sea food while watching the fish .I would recommend going for Lunch as the view is amazing. All restaurants offer Moët or Tattinger and any premium brand drink. The cocktails were amazing especially the Night Caps. 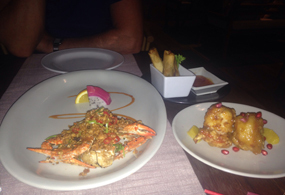 There is a Chinese with the largest prawns I have ever eaten and a fabulous Indian which has a menu from all regions. I went on a snorkelling trip to see Turtles and saw five large ones on the surface and about 8 smaller ones in the water. It was a lovely area to snorkels .There is a complimentary snorkelling trip twice daily plus boat trips to see Dolphins, night fishing, a local village and a private island picnic. We went on a catamaran for an hour which was great sailing around the islands. Your transfer was by seaplane and it is amazing to see all the islands surrounded by reefs, lagoons and beautiful turquoise clear water. After about 30 minutes we landed on a pontoon in the middle of the ocean and a speed boat collected us to go to our island. Even the deep water was so clear and a beautiful blue. We arrived at the end of a long jetty where there was a restaurant and dive centre. Outside our room the beach was shaded by trees and a short walk to the water’s edge. The pool was very large with waterfalls on both sides and a swim up bar with a friendly barman. One end of the island there was another beach bar and water sport centre. It had a sand cay to swim out to. The other side had the water bungalows and another restaurant and the spa. In the middle of the island were beautiful gardens and a small golf course, tennis courts, football pitch and volley ball. The island is large about a mile long by a quarter of a mile wide. One night a buggy took us to the opposite end of the island to feed the stingrays and to the water bungalows to feed sharks and rays. We ate in a large open sided buffet Restaurant. In the evenings they had entertainment in the huge bar area. Sometimes it was a live band or karaoke and one night traditional Maldives dancers. We went on a sunset fishing trip. It was awesome sitting in the middle of the ocean watching the sunset with 360 degrees of ocean and then being in the pitch black with just the stars. The reef was just at the end of the jetty and the fish were amazing especially the noise of parrot fish eating. They decorated our bed with petals shaped as a heart on the last night.